I came across the Yoak on Instagram, and I was immediately intrigued by the possibilities. What’s that you say? You don’t know what the Yoak is? Well then my friend, read on and prepare to be amazed. My coworkers are used to seeing me walking our office halls with strange-looking fitness gear, but nothing has solicited as many odd looks as the Yoak. I had no less than four of my engineer coworkers tell me the Yoak looked like a Klingon battle axe. Go figure. 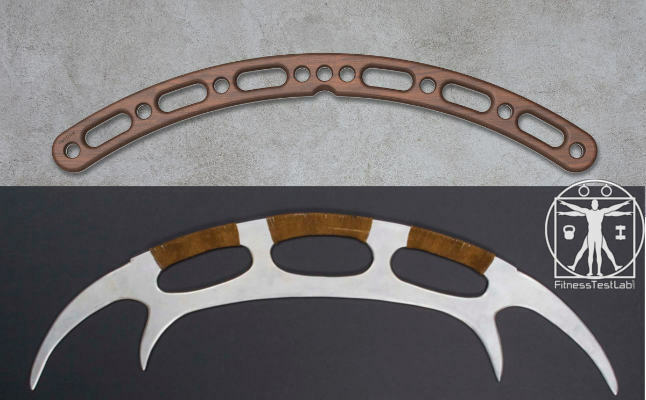 The Yoak – Stability training tool or Klingon combat weapon? 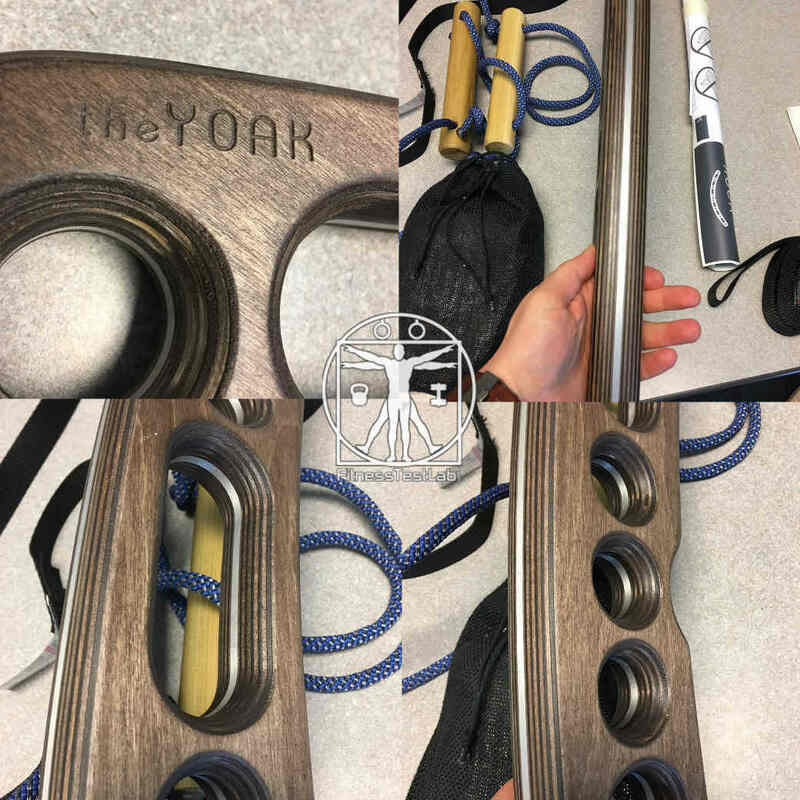 The Yoak is actually a very well made stability training tool. If you’ve never done any kind of instability training, consider that life is inherently unstable. Whether it’s lifting children, moving furniture, or doing yard work, we rarely find ourselves in situations that require a perfectly balanced application of strength. Real life is always a little bit off-center, and the Yoak offers many ways to better prepare for those unbalanced situations. 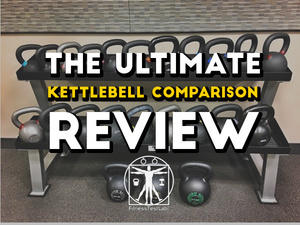 The Yoak can be used as a barbell replacement for practically any pressing or curling exercise, including some kettlebell exercises. This is where the Yoak really shines, since hanging weight off each end introduces serious stability challenges. With weight hanging off the Yoak instead of centered on a traditional barbell, very small movements of the weights cause ripple effects that increase the challenge of keeping the Yoak stable during pressing movements. This type of training has fancy names like Oscillating Kinetic Energy (OKE) and Chaos Training, but for the sake of simplicity just think of it as trying to lift weights that wobble unpredictably. Constant small muscular adjustments are necessary to successfully lift a wobbly weight, which has the interesting side effect of making it easier to lift stable weights as well. It also makes you more resistant to injury since you can better adapt to instability in everyday life. The Yoak is offered in three different package options, differing mainly in the number of accessories. I received a ‘Total Package’, which comes with every available accessory. The Yoak is made in Canada, and the finished product looks and feels extremely well made. The Yoak weighs about 5.5 pounds and is rated to hold up to 400lbs of weight, which is very impressive for something so light and relatively small. The strength of the Yoak comes from an aluminum core, which can be seen in the pictures above. 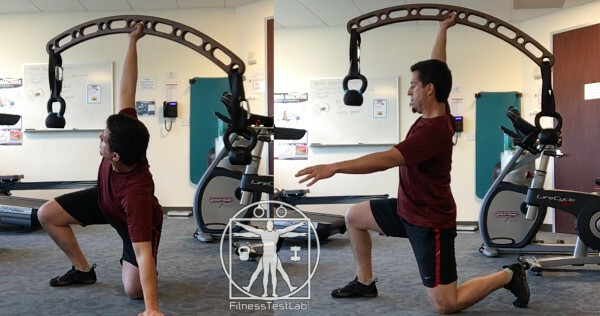 The Yoak can be used in three distinct ways for instability training. Hang it up for suspension exercises, hang weight off it for pressing exercises, or put it on your shoulders for leg exercises. There’s a fourth way to use two Yoaks as parallettes, but since I’ve only got one I’ll focus on just the first three. 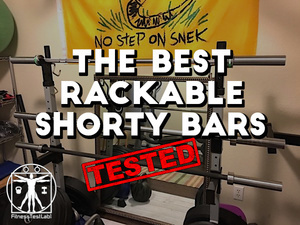 Hang the Yoak from something sturdy and you’ve got a nifty unstable bar for pull-ups, rows, or any other suspension exercise that can be done with a bar. The single point of suspension combined with the ability to to place your hands practically anywhere on the Yoak make already difficult exercises even more ridiculously hard. Pull-ups and rows with the Yoak made me realize my left side was significantly weaker than my right. This isn’t a surprise since I’m right-hand dominant, but it’s interesting how obvious my imbalance became after a few sessions with the Yoak. I found the squared shape of the Yoak handles difficult to grip and therefore uncomfortable to hang from, but this issue was easily remedied by hanging on to the top of the Yoak instead of the pre-cut handles. The Yoak package I received came with two wooden dowels with climbing rope that could be used for suspension exercises, but I didn’t find them particularly useful. 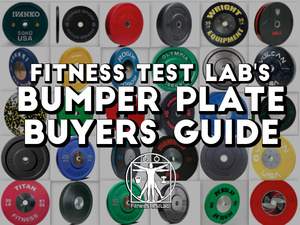 I tried them once and never used them again, preferring to use Olympic rings instead. Let me just say, doing dips and pushups on Olympic rings suspended from the Yoak is freakin’ awesome. Both of these exercises are hard enough with the rings individually suspended, but exponentially harder with both rings hanging from the Yoak. As mentioned previously, the Yoak really shines when used for pressing exercises. I used the Yoak mainly for Turkish get-ups and overhead press, although bench press would be another common way to use it. 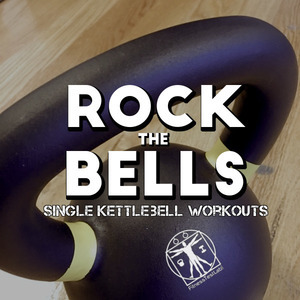 I can normally do a full Turkish get-up with a 20kg kettlebell, but I struggled mightily with only two 6kg kettlebells hanging off the Yoak. I can currently press 100lbs overhead for reps. Using the Yoak, I found pressing two 25lb plates hanging off each end incredibly difficult. The Yoak is no joke! 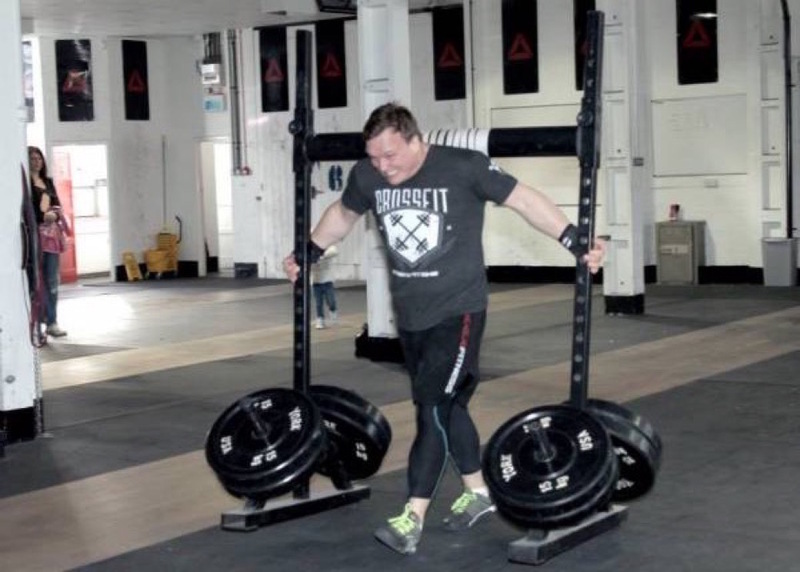 Perhaps unsurprisingly, the Yoak can be used as a yoke for squats or…wait for it…yoke walks. This looks hard, right? Yep, it is, but try it with weights hanging off the Yoak and it becomes ludicrously hard. Same with squats, which are essentially a pressing exercise. Remember what I said about how difficult the Yoak makes pressing exercises? Yep, the same applies to squats. Although not specifically advertised as such, the Yoak can be used as a cable bar for some good transverse plane core work if you have access to a cable machine. The Yoak is well made and built to last. 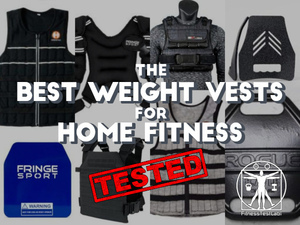 It’s versatile and works well for building strength through instability training. I’ve never come across a tool so well suited for a specific purpose like the Yoak is. I’ve seen a marked improvement in my squat, overhead press, and pull up just from using the Yoak, and although I can’t quantify injury prevention, I feel like my shoulders are quite a bit more bulletproof just from doing Turkish get-ups and pull-ups with the Yoak. Let’s get this out of the way up front – at $300 for the base model, the Yoak is not an impulse buy. Is it worth the cost? It depends on how you look at it. 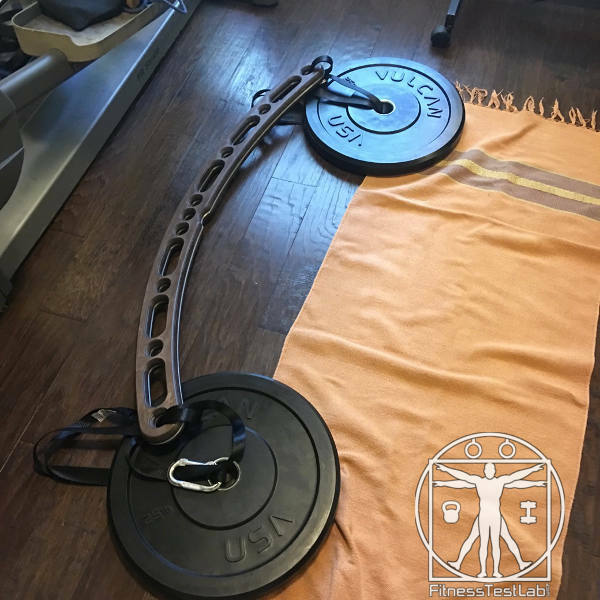 Other instability training products like the Earthquake bar are nearly the same cost, but only applicable for pressing exercises. The Yoak can do everything an Earthquake bar can do, but an Earthquake bar can’t be used for suspension exercises like the Yoak can. Questions of cost aside, I’m not particularly enthused about the accessories that come with the total package. Working with the Yoak for presses can be made easier or harder by adjusting the hanging distance of the weights, but I found the fixed-length straps to be too limiting for this purpose. I much preferred using the adjustable cam buckle straps that came with my Olympic rings to attach weights to the Yoak, and I preferred my Olympic wooden rings over the wooden dowels for exercises like dips and pushups. 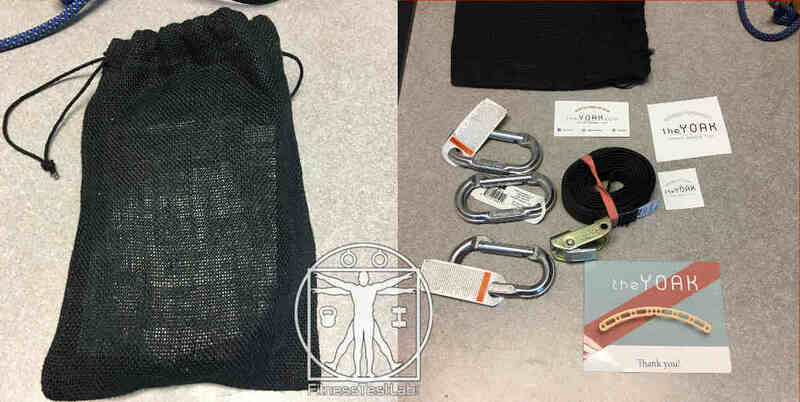 I did find the single 24″ fixed strap and carabiner useful for hooking the Yoak up for suspension training, but the rest of the stuff mainly stayed in the storage bag. 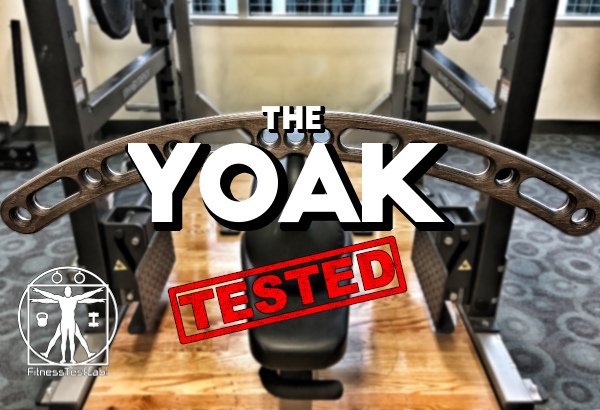 The Yoak is an interesting and effective training tool that deserves serious consideration as an addition to your home gym. Yes it’s pricey, but if you’ve got a place to hang it from and some weight to hang off it you’ll definitely reap great benefits from it. I don’t recommend the accessory packages as offered at the time of this review since in my opinion they don’t offer enough value for the added cost. Buy the base model and a good set of Olympic rings instead and you’ll be set. 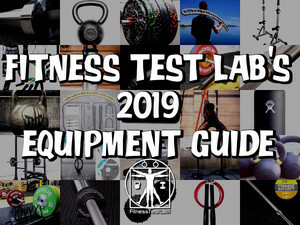 The base model comes with a single cam buckle strap that can be used for suspension and the Olympic ring straps can be used to add weight for pressing and squat/yoke exercises. The Yoak is distributed in the US by Rogue Fitness, and you can buy the Yoak directly from them here.